Salt, pepper, and the burning embers of a fire are the three ingredients that make this ancient salumeria’s products special. Its roots go back to when food preservation meant survival. 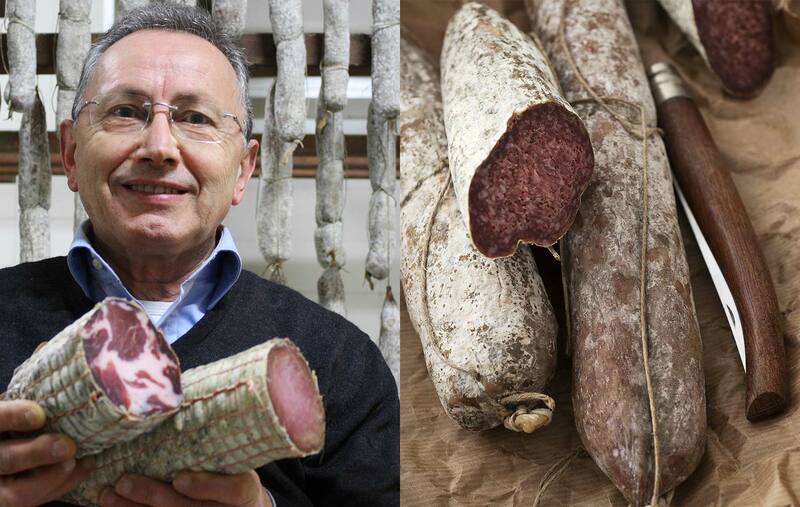 Luciano Pelucchini, owner of the charcuterie Bilei in Fabriano with his family, is overflowing with knowledge that he wants to share. He could write a book on the Marche region without once cracking open an encyclopedia (or, nowadays, surfing the web), so accurate is his knowledge on the history and culture of this territory. He rattles off dates and tells us anecdotal stories that are completely supported by historical documentation as he welcomes us into the small space at the entrance of his salumeria. It looks like a mini-museum. Luciano is the proud spokesperson of a company that was already known and appreciated by Giuseppe Garibaldi (he immediately shows us an autographed letter as proof), acquired in 1890 by the brothers Giuseppe and Torquato Bilei. Luciano himself entered into the business through marriage. After his father-in-law passed him the reins of the business in 1985, he has never deviated from the hundred-year tradition of Bilei. “Here, we’re strongly against the use of chemicals”, he says. “We make our salami the old way, with salt, pepper, the heat of the fire and, most important, the natural time it takes for it to cure and season”.The slow time of salami maturation is often cut artificially short in intensive production in order to produce more salami, faster. They raise their pigs with foresight in the zone of Frasassi. The animals only eat corn and potatoes which, coupled with the fact that nothing more than salt and pepper are added to the meats, means that Bilei salami is perfectly healthy for those on a gluten-free diet and for pregnant women. Those who believe a pig is not worth such meticulous care need to meet Luciano, and listen to him while he explains all the nuances of flavor that a healthy pig brings to the product. Intrigued, we enter the inner sanctum of the salumificio where all the magic happens. The drying chamber is a cozy room that dates back to the 1200s, with coffered ceilings and a hearth where embers burn slowly, occasionally sparking with light. “This is the secret,” says Luciano, “The flavor and quality of salami is born here, during the drying.” In the drying chamber, the casings are filled and left to rest for 4-5 days if they’re small like the salami and soppressate, or 20-25 days for the larger prosciutti and lonzini. The flickering oak and juniper wood are fundamental as they slowly dry the meat. The salami has all the time it needs to absorb aromas, and the juniper is especially strong. Once they are perfectly dry, the curing continues in the large cellars. Here, there is prosciutto, salami, soppressate, sirloins, and lard all suspended from iron rods mounted on wooden racks and given plenty of time to age. The flickering oak and juniper wood are fundamental as they slowly dry the meat. It feels like we have stepped back in time. The semi-dark atmosphere, stone walls, and woodwork have transported us to the Medieval ages, where whispers of ash and ember constantly hover over the hearth. Luciano pulls us back to the present as he sharpens a knife. We catch whiffs of perfectly cured meat and watch as the salami is sliced, revealing meaty redness and smooth, white fat. Bilei has won us over. We are not surprised when Luciano tells us at the end of the day that his greatest satisfaction is the relationship with his clients. He loves seeing their attentive eyes when he explains how the salami is made, and seeing them light up when they taste the pure flavor of his products for the first time. How could it be otherwise? There is perhaps nothing more beautiful in this world than sharing your passion with others who appreciate it.